How are you? Hope you are all doing well. Today I am happy to be sharing with you another whimsical character from the Biskuttina range. How many times have we wished to possess the power to extend certain moments forever?! When we are having fun, enjoying our loved ones, or experiencing something beautiful time just flies! While I was sketching the image for this stamp I was listening to the mesmerizing voice of Josh Groban. I think his voice is so well-suited to interpret prince charming characters and main roles in musicals!! It has a particular sound and quality to it which I find amazing. I particularly love his cover version of the song â€˜For Alwaysâ€™ which you can listen to here. It was part of the inspiration for this concept I was thinking about. I think subconsciously I included the butterflies as a reminder of Spring which is something I wish for a lot at the momentâ€¦.the sun, the beautiful flowers, the enchanting colours, birds chirpingâ€¦.all these elements make this season the best time of the year and by now I am sort of fed up of Winter and looking forward to a bit of changeâ€¦so Spring I welcome you with open arms! I hope you like the image. You can find it in my shop here. I leave you by wishing you many moments where time just flies!! 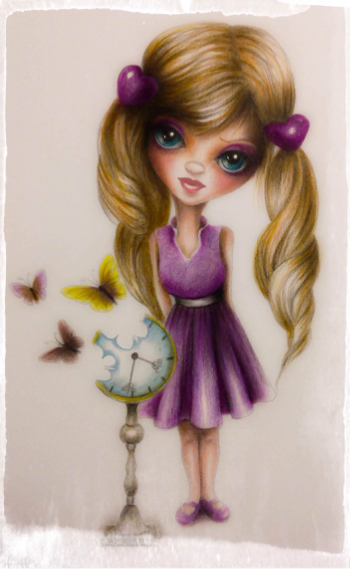 This entry was posted in Keeping in touch.... and tagged Biskuttina, Clock, Friendship, Love, Missing, Spring, Time, Time Flies, Wings on February 27, 2014 by Penny Blossom.